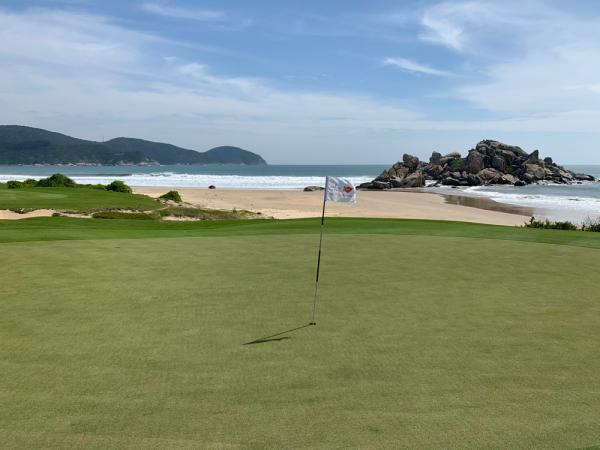 Our experience included the beautiful courses of Blue Bay and Clearwater Bay to the two Tom Weiskopf courses at The Dunes on the Shenzhou Peninsula finishing with four courses at Mission Hills Haikou. 7 Men and 7 Ladies enjoyed the golf and each others’ company as we encountered a new experience each day. This tour we welcomed Myrna Hastings from Vancouver as our special overseas participant. The caddies were a different standard to those of Thailand and Vietnam in that not all could speak English – though the Mission Hills caddies seemed more versed in the language than at the other destinations. It became obvious after the very first round at Blue Bay that Peter Tanner from Pelican Waters was going to the person to beat once again. In all the times I have had the pleasure of playing with Peter – I can say that I have never seen him strike the ball and play so well.